By Peter Anderson 13 Comments - The content of this website often contains affiliate links and I may be compensated if you buy through those links (at no cost to you!). Learn more about how we make money. Last edited March 25, 2014 . This post helped me to win the Free Money Finance March Madness Competition and donate $500 to Second Harvest Heartland Food Bank. You can help make a difference in the lives of hungry families as well by donating HERE. Since I started writing this blog back at the end of January 2008, I have learned a lot about money and managing my family's finances. I never considered myself “bad with money”, but I knew we were doing a lot of things that were getting in the way of our financial success. My wife and I attended a class through our church called Financial Peace University. The class, put together by Dave Ramsey, really opened our eyes to some things we were doing that were hampering our financial success. 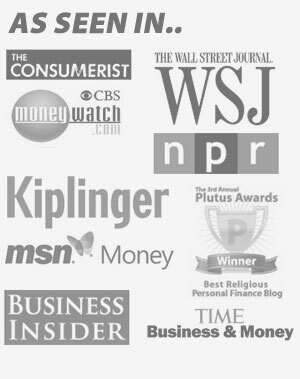 In the spirit of sharing some of the things we've learned along our road to financial peace, here is a list of 10 things I've learned about money since I started blogging. When you have debt, you are a servant. Only once you have gotten rid of your debt and are living free can you truly work on your way towards true financial independence. Having money does not mean having happiness: True happiness does not come from having things, or from having money. When you have money, you only want more. Money is a never ending black hole where you never have enough. True happiness comes from having a strong faith in God, and knowing your true worth is found in Christ, and not in things of this world. Once you realize that, it makes it so much easier to be happy! Lending money to friends and family is almost always a mistake: One thing I've come to realize is that lending money to family or friends is almost never going to be a good thing. By the nature of it, when you lend money it changes the relationship from one of family, to one of master and servant (see the verse above about the borrower being slave to the lender). If you're going to give money to family, give it and don't lend it. By the same token, don't co-sign. There is usually a reason why someone needs a co-signer. Giving helps not only the person you're giving to, but helps you as well: Sometimes you feel like you don't have anything to give, or you can't afford to. I've found this year that when you make a plan, you will always have something to give. Giving isn't always easy, but when you do, you will be blessed. Earlier this year when my wife and I actually started giving more regularly, I found that the amount we had started giving, was almost exactly the amount I had started making on this blog. When you give even when you don't know if the income is there – God will provide. No need to worry, God will provide: We went through some very hard things earlier this year when my wife was hospitalized for almost a month and we had medical bills in excess of $250,000. If we hadn't had insurance we would have gone bankrupt. If we hadn't been saving for a rainy day through our emergency fund we would have gone deeply in debt.God knows what we need, even before we need it. Even if we aren't able to provide for ourselves, he will find a way. Start saving as early as you can: The earlier you start saving for your future, the better off you'll be. Interest that you earn on your money compounds at an amazing rate if you start saving early. The wonders of compounding interest! It's never too late to start! We are only stewards of everything we have: God has given us so much material wealth here in America. We must remember, however, that everything we have is God's. We are only stewards of these things for a short time, and we must be careful how we use what we are given. We must use what we have for God's glory. “Easy money” is almost never actually easy. Get rich quick schemes often don't make you rich quick: There are a lot of get rich quick schemes out there offering quick and easy riches. I've learned through experience that “easy money” or “getting rich quick” is almost never easy or quick. Most often the best way to make money is through hard work, and saving little by little. 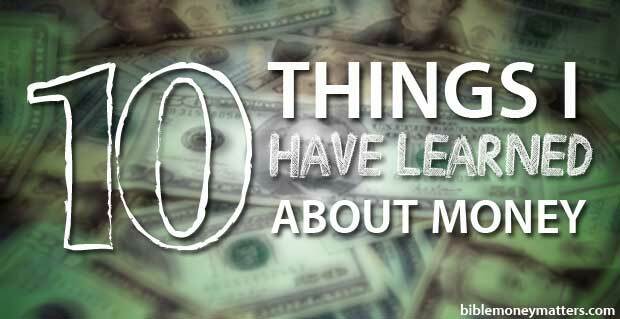 So there it is, 10 things I have learned about money in the past 6 months. What are some things you've learned about money that you'd like to share with others? Leave a comment and tell us all about it! Great post! I think you and I started learning about the same time… excellent summary and I look forward to learning with you in the future! Thanks – and Good luck on finishing up the move! Owe no man any thing, but to love one another. For he that loveth his neighbour, hath fulfilled the law. Contras last blog post..What the…? Love the blog, I started in January as well and I couldn’t be more happy with what I have learned in fpu. one thing is that you can lead a horse to water but you can’t make him drink. and also how great it feels to give when you have to give. This verse really hits home that my way is the wrong way, it was all given by God and we need to take care of it and also give back. Those tips are great. I learned lesson #4 the hard way – and I’m sure others have had to learn these lessons the hard way as well. It’s good that Dave is giving this advice so people can learn from his experience instead of repeating the financial mistakes of others. Ph. 4:19 But my God shall supply all your need according to his riches in glory by Christ Jesus. Ps. 36:8 They shall be abundantly satisfied with the fatness of thy house; and thou shalt make them drink of the river of thy pleasures. V. 41 And Jesus sat over against the treasury, and beheld how the people cast money into the treasury; and many that were rich cast in much. V. 42 And there came a certain poor widow, and she threw in two mites, which make a farthing. Those 4 verses break my heart every time I read and pray on them… All that we have belongs to God the Father…Ruler of all heaven and earth. Great advice! These 10 cover a lot of the basics as far as personal finance goes. Keep on writing man. Thanks Peter. We are working on our debt using the snowball model. Have you heard of it? You can’t go wrong with these as your roadmap. I am also very impressed with David Brown’s “Abundant” comment. The only one I would add is Proverbs 27:23 “Be diligent to know the state of your flocks, and look well to your herds” I wrote a post about it (follow link). Great post, great blog, great comments! Previous Post: To Debt Snowball or Debt Avalanche, That Is The Question.